The birth of a grandchild is so special, because there is a great gift for grandmother. Or maybe for yourself, to hold the moment. What's more beautiful than a silver pendant with all the names of grandma's grandchildren incorporated into it. This silver ornament will really wear them, the biggest treasures close to her heart! Or for a 3-generation set, one for grandma, one for mama and one for granddaughter, forever connected! 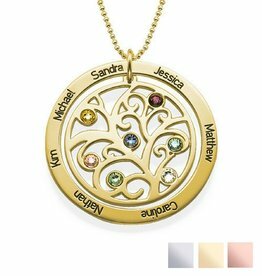 For a mother her family is everything, and now she can keep her family near her with our beautiful Cut Family Necklace with six birthstones. We found the perfect gift for mothers, Triple Heart Necklace with birthstones in 925 Silver! Personalize each heart with a name or a word that you want! This necklace is made of 925 silver and comes with a chain. 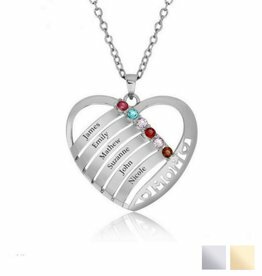 Show your beautiful family to everyone with this beautiful Family Heart Necklace with birthstones. Sweet gift for mother or grandmother if they houden.Je their children to be close to them can have up to six names engraving and pick up six stones. Her birthday, a jubilee or just because she is the dearest grandma in the world? Give her an original gift that you have chosen for her. 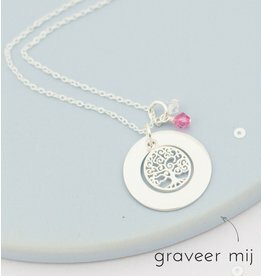 The relationship between a grandmother and her grandchildren is forever, show this with these beautiful jewelry. For example, choose a bracelet set for grandma, mom and granddaughter (s). For example, the little girl carries the key of which mom and granny own the lock. That's how the baby carries the key to you, how sweet grandma's gift is that? If you have a baby later, you can easily expand this set. What makes grandma so special? All grandmothers have experienced so much what you will experience yourself, which makes her stories so special. Your grandmother helps you to make the best pizzas, teaches you punnies and teaches you to just be good to yourself. Grandma makes you most happy with a gift you have chosen with care and attention, so KAYA makes special jewelry that lets you engrave words, grandchildren, or data. A personal and sweet gift that grandma will carry with all love! Will there be more grandchildren in the future? Then you can choose a generation set that will be expanded later with extra baby bracelets. Or choose a pendant with loose children's beds like this one . 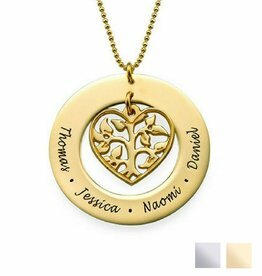 You can also choose a mother's symbol, symbolically for the grandmother of the family. All in all, enough choice to let her shine with a carefully chosen gift. A 3 generation set gift, everyone will radiate! Do you just want to unpack it a little and give a gift to grandmother, not just grandmother? Then a 3 generation set gift is perfect for you! From sweet bracelets with freshwater pearls to tough chains with engraved charm, there is something for everyone. The fun of our three generation sets is that you can easily expand the sets to more, so your sister is also fabulous! An absolute top chef at every grandmother!